So much character, in fact, that Ricky Gervais says one US journalist complimented him on being prepared to wear unflattering false teeth for his role as an English dentist in his latest film, Ghost Town. Only he didn’t. “He was horrified that I could have such horrible real teeth. It’s like the biggest difference between the Brits and the Americans, they are obsessed with perfect teeth,” says Gervais. Unlike many British stars hoping to make it big across the Atlantic, Gervais hasn’t bought himself a Hollywood Smile. But what is it about the bright white and perfectly straight teeth of Los Angeles that Americans love – and expect of their public figures? She says Americans aspire to a row of teeth which are absolutely even and white. Whiter than white, it transpires. Teeth naturally vary in colour and the palette can tend closer to cream than white. “US teeth are sometimes whiter than it is physically possible to get in nature – there is a new reality out there. The most extreme tooth bleaching is terrifying, it looks like it’s painted with gloss paint and has altered what people perceive as normal,” says Professor Jimmy Steele, of the School of Dental Science at Newcastle University. 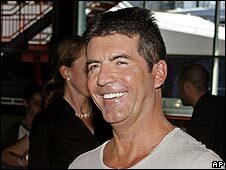 The British traditionally prefer “nice natural smiles – natural in colour”, he says, and have had a more functional view of teeth and dentistry, whereas Americans have always seen teeth more aesthetically, hence the rise of the artificial smile in show business and pop culture. UK the snide remarks are saved for those who have had obvious work done, such as Simon Cowell or glamour model Jodie Marsh. When it was widely reported that Martin Amis had secured a book advance in 1995 to help “do his teeth” – which the author denied – he was lampooned by critics. And more recently there has been much speculation over whether Gordon Brown has had a smile makeover. Until now it has been considered rather un-British to go for an upgrade, says Professor Steele. He now performs cosmetic dentistry on a wide spectrum of patients, from an 82-year-old woman with overlapping teeth who finally wanted to “do something for herself”, to a 17-year-old worried that fluoride had given her mottled teeth that were whiter than normal. But the main difference is that Brits tend to go for more conservative treatments. “Dental tools can do an awful lot of damage if used inappropriately. Crowns can mean a perfectly good tooth has to be cut down, which can weaken the tooth or damage nerves in the long run,” he says. While it is starting to be more common to see braces on adults, most people opt for quicker solutions, says Martin Fallowfield, a cosmetic dentist and executive board member of the British Dentist Association. “Quite often teeth whitening is a 40th or 50th birthday present,” he says, a procedure that can be done in a dentist’s chair in two hours for about £650. A more intensive “smile makeover” – perhaps involving veneers, crowns and reconstruction work – can take months and cost anything from £2,000 to £10,000. Dentistry in the UK is a £5bn market, and Mr Fallowfield expects this to rise to £15bn within 10 years, largely fuelled by private cosmetic dentistry. 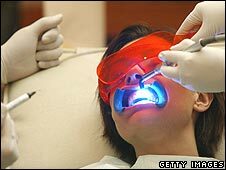 While NHS dentists are in short supply in parts of the country, the number of dentists registered with the General Dental Council is up from 31,029 in 2000 to 35,419 in 2007. On average, cosmetic procedures account for a third of a dentist’s income from non-NHS work, according to research by the British Dental Association. Among Mr Fallowfield’s patients is Jenny Horton, 36, who has had four crowns redone, six new ones added and her lower teeth whitened after she had a baby. But Brits haven’t embraced the full Hollywood makeover – yet. “Americans don’t mind this unnaturally white look. It’s a new phenomenon, like buying a Rolls Royce and telling the world. They are wearing a smile as a badge,” says Mr Fallowfield. As for the likes of Ricky Gervais, it makes sense to stick to his guns, says Mr Fallowfield.